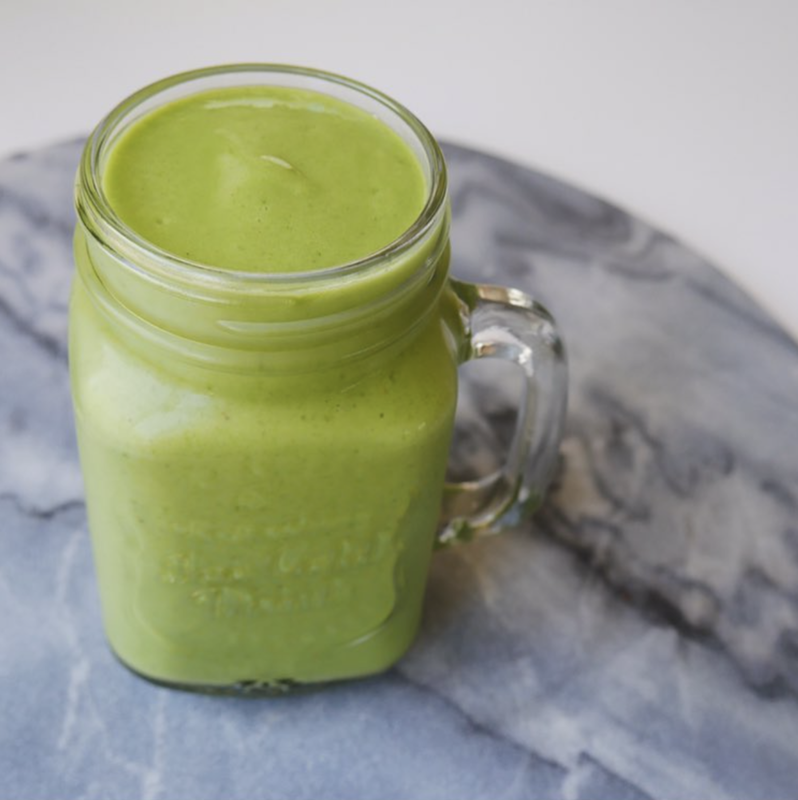 This is my all time favourite Smoothie recipe that I enjoy almost everyday. It gives me the energy I need at 6am when I'm about to start my first round of sessions. It's clean, filling and full of all the greens. Put all the ingredients into a @thenutribullet or in a blender, mix, pour, enjoy! I had the most amazing dinner last night. It was the perfect combination of fresh and comforting. This super easy recipe can be done by anyone. My husband really doesn't enjoy cooking fish as he complains that it is A) Difficult B) He always overcooks it and C) He thinks it makes the house smell like fish for a couple days. Thankfully this recipe cuts out all the problems! Because it takes no time, it's cooked in the oven and the coconut oil and milk keeps the fish plump and juicy it's a great mid week recipe. 2. Line a baking tray with aluminium foil and either spray or drizzle olive oil. Place the fish on top and season both sides with salt and pepper. 3. Place fish in the oven for about 5 minutes. 4. In a medium bowl mix together the crushed macadamia nuts, coconut meal, coconut flakes, coconut oil and parsley. 5. Take the fish out of the oven after the 5 minutes and spread with the coconut milk on the bottom part of the fillet, then spread the nut and flour mixture and place it back onto the pan. Brush the remaining coconut milk onto the top before using your hands to press the rest of the nut and flour mixture onto the top of the fillet. 6. Return the fish into the oven and bake for another 5-10 minutes or until slightly golden brown while still continuing to stir through the coconut rice. 7. 5 minutes before the fish is ready put the steamer on for the broccolini or any other green vegetable. Bok Choy, Broccoli or Brussel Sprouts would suit. Mix all together and fry in pan like fried rice. 1 Week Down 3 Weeks To Go! I hope your first week of the 30 day challenge has gone well. How are you doing?? Have you found some better supplements for the food or beverages that you're cutting out for the month of April? Below I've attached all the information you'll need for the up coming week of the challenge. You will see your new Food Diary Print out with next weeks dates for next weeks planning. Also, I've attached some of my favourite Slow Cooker recipes. It feels that Winter has really arrived in Melbourne - I know, it's still Autumn but my goodness it's been cold in the mornings and at night. 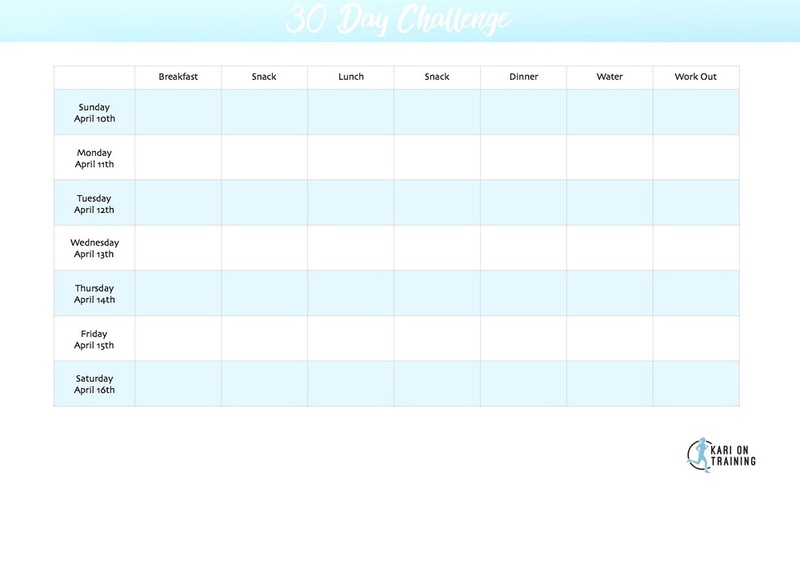 There are 3 healthier recipes that you can try during your 30 day challenge for some inspiration. Finally, I've also attached my Bali Bootcamp Flyer. I only have 4 spots available and this year I have an exciting prize to give away to one lucky guest - a M400 Polar GPS, Heart Rate & Blue Tooth watch. 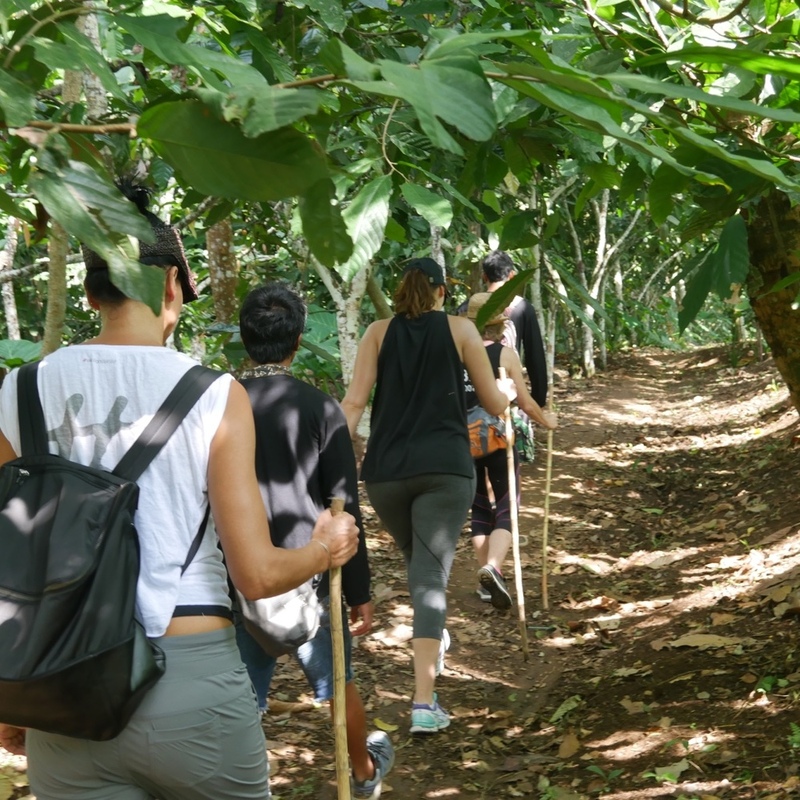 Join me in Bali for a holiday filled with Fitness, Delicious Food, Massages and Tranquility. Click on the details below! Does anyone else feel like they had a too many Hot Cross Buns & Wine and not enough carrots and water over the Easter Holiday? I've had a few clients tell me that they need to push the restart button on their Health & Fitness so we've decided to challenge ourselves for the month of April. For 30 days we're going to cut out the food and beverages that we've indulged ourselves with over the Holidays. Personally I'm cutting out Wine, Bread & Chocolate for the month of April. These may not be your delicacies but you can pick something that you feel that you've had a little too much of over the holidays that will make you feel clean and healthier at the end of the month. We can rock these next 30 days and I'm sure you'll feel healthier, lighter and happier at the end of the month!! And best of all, we'll be doing it together! Below you will see a few clean, lean and green recipes that you easily prepare during your busy work week. I have also attached your Food Diary, this is the most important tool as it will be your golden ticket to keep you on track! You just need to print out 2 copies, one for planning ahead to put on the fridge so you know whats coming (which means you won't be reaching for a bad take away option because you haven't prepared) and one for personal use to write down what you're having during the day. It also helps to make sure you're on track with drinking enough water throughout the day. Each week there is a new Food Diary to fill out with the specific dates titled along with some recipe ideas. Are you still in need of a bit of a push? 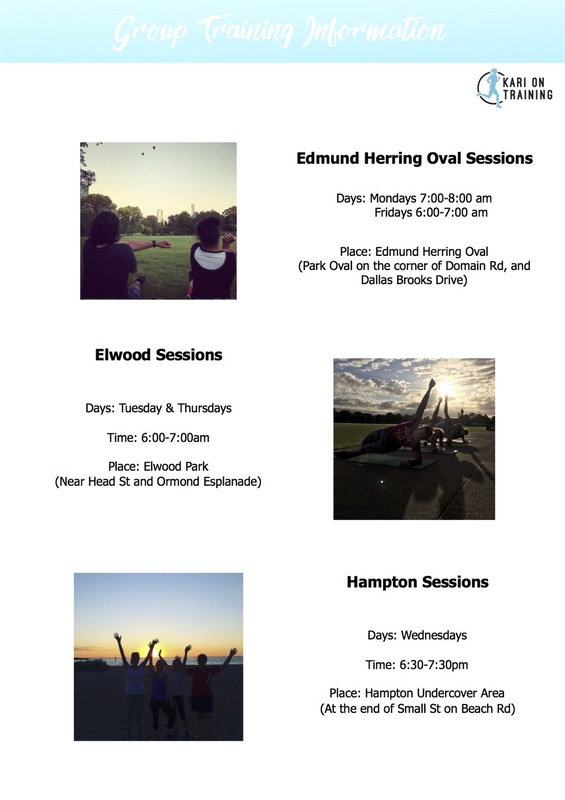 Don't forget about my Group Training Sessions in Elwood, Hampton and The Bontaical Gardens! It's the perfect combination to make these 30 days count And better yet, since it's group training it means it's a low cost option while still getting a killer session in! These are one of my Go To Recipes. They are the perfect snack, they're great for longer endurance sports such as Cycling, and they hit that sweet spot when you're craving sugar without the added calories. I bake these up on a Sunday in no time and my clients absolutely love them - and so do I!! Check out your local The Source Bulk Foods for all the ingredients you'll need below. They have fantastic Organic ingredients where you can get only as much as you need to provide a fun and "no waste" experience. I love getting all my ingredients from The Source, it's like a adults toy store for healthy people! Line 12 muffin cups with paper liners or oil with natural cooking spray and set aside. Preheat the oven to 190°C. Place carrots and dates in the bowl of a food processor. Pulse and then blend until finely chopped. Add walnuts and pulse to finely chop. Transfer to a bowl; add oil, eggs and maple syrup, stir to combine completely. In a separate bowl, combine all remaining dry ingredients. Pour liquid ingredients over dry ingredients and stir until just combined. Spoon batter into prepared muffin tins and bake for 20 to 25 minutes or until a toothpick inserted in the centre of a muffin comes out clean. 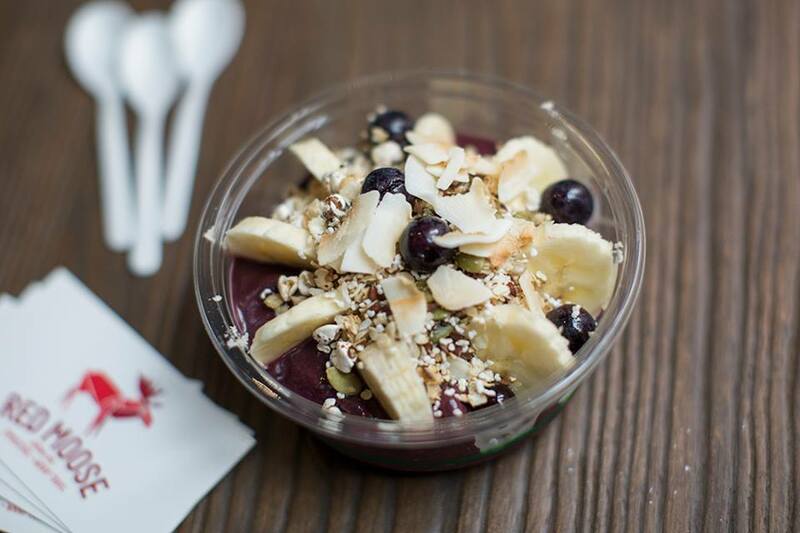 Whether you live bayside or not, Combi should be at the top of your health food hit list — that is, if you don’t mind waiting for a seat and a smoothie. 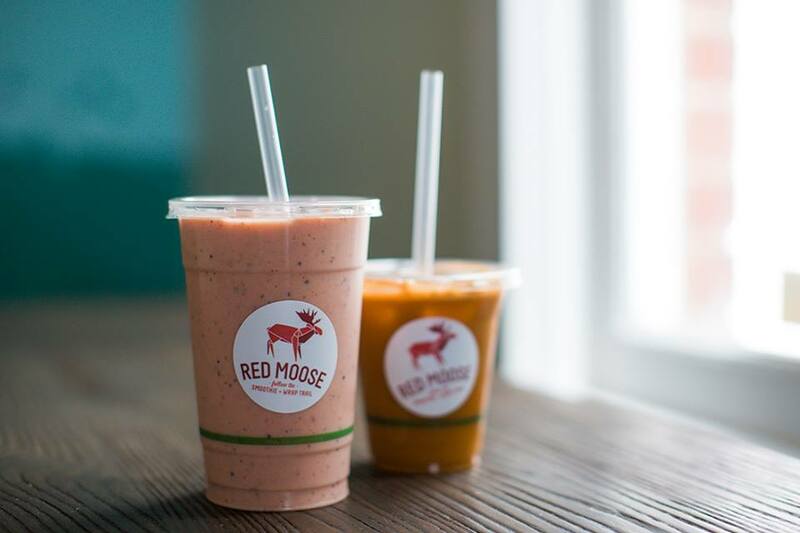 Once you get your hands on vegan sandwich and liquid passion superfood smoothie, you’ll forget that wait in a second. What to order: Avo on homemade vegan toast with a Greenie Smoothie to wash it all down. Down To Earth creates delicious organic meals that tick all your healthy eating requirements. 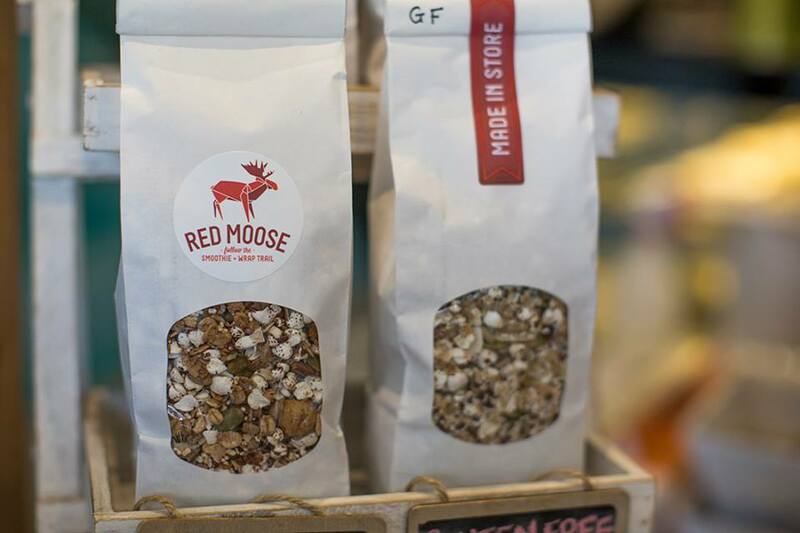 Their amazingly healthy superfood creations are sourced from local suppliers. 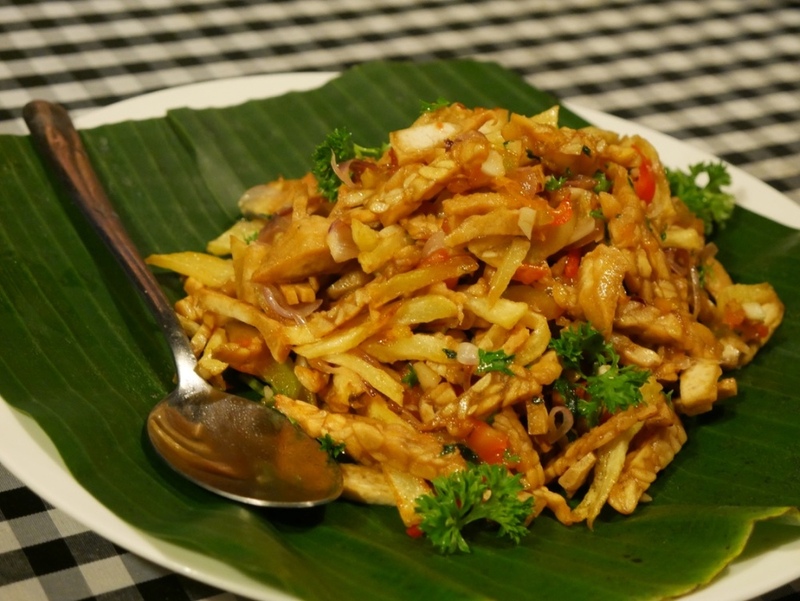 They offer a wide selection delicious take home meals for the hard working professional as well as full eat in menu. The options are endless! Pick a seat in the refreshing courtyard or relax inside this cafe has it all. 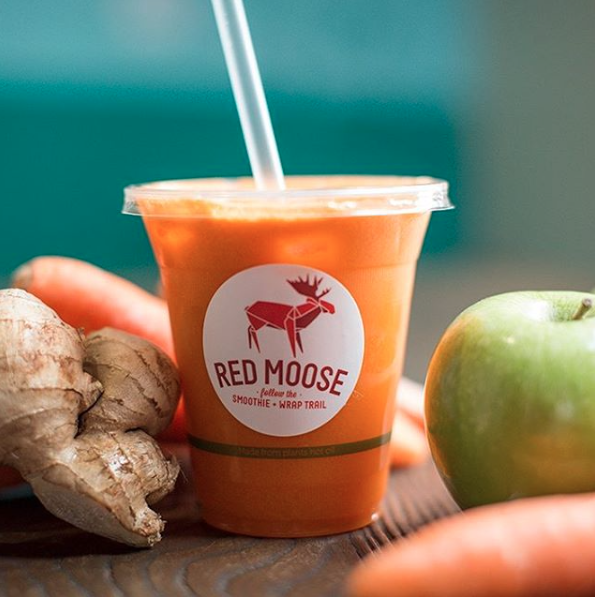 Along with plenty of delicious healthy meal options on the menu they also have Matcha lattes, Choc goji and Maca peanut butter bliss balls, Almond milk and single origin coffee from The Mailing Room. What to order: This Okonomiyaki Fritters dish. 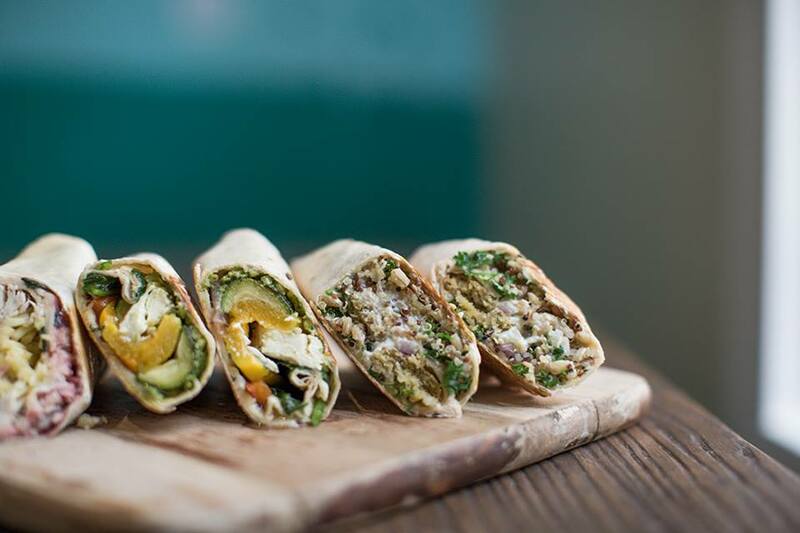 Holy Bowly is about healthy, clean, honest, refreshing, grab and go food! It has a funky young energetic vibe with modern decor and customers of all types enjoying the market fresh organic treats - whether they be juices, soups, raw food treats or dippy eggs with soldiers! Urban Projuice is a Whole food Cafe & Juice Bar. Not only are the committed to bringing fresh produce that is locally grown, seasonal fair-trade and organic but they also provide workshops, cooking classes, holistic coaching and catering. What more could you want?? What to oder: Superfood Breakfast Salad - Two poached eggs on seasonal greens with mushrooms, avocado mash and sprinkle of super seeds.